The introduction of the Soyuz TMA-M spacecraft (industrial designation - 11F732A47) became the latest step in a series of gradual upgrades to Russia's legendary manned transport. Originally designated as Series 700, Soyuz TMA-M was also informally known as "digital Soyuz," -- a reference to an advanced flight control computer onboard. Systems introduced in this round of modifications also promised to pave the way to the development of the new-generation manned vehicle. 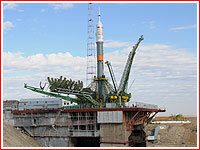 After some delays, the first Soyuz TMA-M made it to the launch pad in October 2010. The goal of the upgrades which led to Soyuz TMA-M was the replacement of outdated equipment, some of which was no longer in production, with more advanced systems, employing modern electronics and software. According to original plans, these modifications were to be more extensive, but in the end, the most radical and expensive proposals had to be postponed to a later date. A total of 36 old instruments were replaced with 19 new systems. The total mass savings resulting from these upgrades reached 70 kilograms. 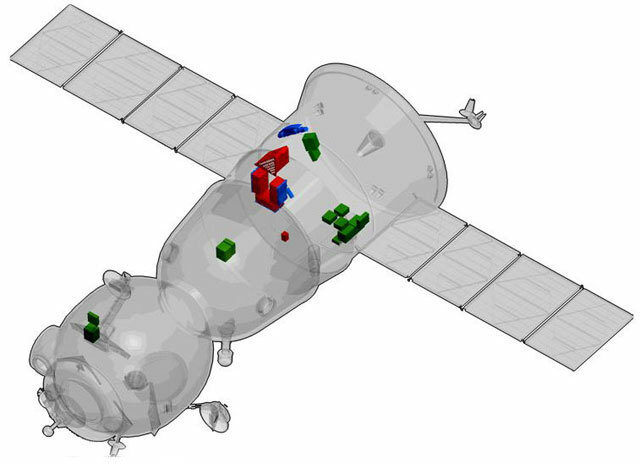 In addition, assembly of the spacecraft on the ground was also simplified. According to Aleksandr Kaleri, who led the first mission of the Soyuz TMA-M spacecraft, the computer system onboard the spacecraft was built according the so-called "open architecture," implying its easy expansion. The SUDN's avionics unit, which manages the attitude control and rendezvous thrusters has been upgraded to make it compatible with the new systems. Modified software was installed in the computers of the descent module, SA. 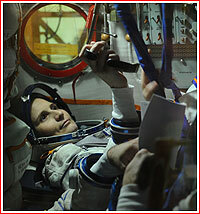 Within the onboard flight control complex, SUBK, the command processing unit was also changed. Associated power supply mechanisms and their protection systems have been upgraded for compatibility with the new systems. Also, the cosmonaut flight control console, in the descent module, SA, was upgraded with new software to work with the new systems. Finally, backup multiplexer channels were introduced to exchange information between computers onboard the Soyuz and those on the Russian segment of the International Space Station, ISS. On the structural side, the truss holding the ship's instrument compartment, PO, would now be made out of aluminum rather than magnesium alloy, which simplified the manufacturing of the spacecraft. The 700th series upgrade program was delayed several times, in part due to the lack of a completed integrated test facility, KS, which could be employed to thoroughly check a fully assembled vehicle on the ground at RKK Energia's test center in Korolev, near Moscow. Instead, RKK Energia resorted to testing individual components intended for Soyuz TMA-M, during missions of Progress cargo ships, before certifying the new hardware for the use on manned vehicles. The method reportedly delayed the introduction of Soyuz TMA-M by around a year. The first mission in the series, designated Soyuz TMA-01M, lifted off on Oct. 8, 2010. According to previous ISS mission schedules, the Soyuz TMA-01M was planned to be launched on Nov. 16, 2009 and Sept. 30, 2010. As many as four missions of Soyuz TMA-M and Soyuz TMA spacecraft were also slated for testing the latest upgrades, before the TMA-M version would be declared operational. The test flight program called for trying out some of the emergency flight modes onboard Soyuz TMA-M, including using manual control for such tasks as maintaining attitude of the spacecraft, flying around the ISS and conducting thruster firings for orbit correction. Originally, the round of upgrades, which led to Soyuz TMA-M development, was known as Soyuz-700 series. The first vehicle of this type was expected to be called Soyuz TMA-01M, in a fashion similar to the latest generation of Progress vehicles. 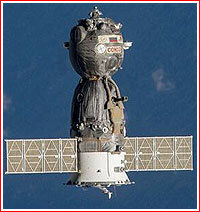 However by the end of July 2010, the spacecraft series was re-christened Soyuz TMA-M. In case this was not confusing enough, subsequent official reports on the preparation of the first spacecraft in the series continued calling the vehicle Soyuz TMA-01M. Some upgrade plans, which were left to the next round of modifications apparently included the move of the main flight control computer, from the instrument compartment, PAO, to the descent module, SA. This change would allow to eliminate the KS0 20M computer in the descent module, which is dedicated to the reentry and landing of the crew capsule after the separation from the PAO module. With the move into the crew module, the same computer would support the entire mission from launch to touchdown. However this proposal had not been funded, even though as of beginning of 2009, there was still hope that the move would be implemented no later than 2011 or 2012. The future plans for Soyuz upgrades also aimed for a complete overhaul of the ship's power supply system, starting with solar panels and all the way to the onboard cable network, BKS. As of 2010, new more effective solar panels for Soyuz were expected to become available within a year. All the changes to Soyuz introduced in 2010 and in the following years could be extended even further, given available funding and the political will. Among technically feasible upgrades, which were informally discussed on the web forum of the Novosti Kosmonavtiki magazine were more capable parachutes made of new materials; the removal of a pressurized instrument compartment from the service module, PAO, which would enable the increase of the ship's propellant load up to three tons; an addition of a new communication gear for lunar missions; and the reinforcement of the crew capsule's heat shield to enable the atmospheric reentry with a high velocity of lunar mission. These modifications could "close the circle" of the Soyuz development history, bringing the veteran spacecraft back to its original purpose, for which it was conceived in the 1960s. The plan could be a backup option for any serious obstacles on the way of the Russian development of the new-generation manned vehicle.